– Reading, Language arts, and Math assessments. – 8-minute tests assessed multiple times throughout school year. – Students start with question 1 and move forward until the time is up. – They complete what they can, and skip what they do not know. – Focused on showing what the students know, and not what they don’t know. – Data throughout the year should show grow as students conquer more and more skills. – Operation/Skill each question assesses does not change. Question one will always assess the same skill, however, the situation (word problem) and values used will change. – Compare to national data, students in bottom 25% move down one grade level until they reach their instructional level. – Adjusts the level of difficulty of the question, while still assessing the same skill, to accurately assess the students grade level ability through understanding what the students can be successful at. – Provides each skill with cartoon instructional/situational videos, and multiple choice problems. – Lets students learn through educational games. – Gives students brain breaks, and mini games every 15 minutes or so, to break up work and increase stamina. – You can create an account for each student, track their progress as they practice, level up, and finally master skills. – Each question is accompanied by a video and hints if needed. 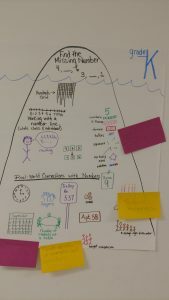 – see what skills students have mastered, which they need work in, look at how many problems they have attempted in each skill, time they took took to answer, and percent correct. This entry was posted in Uncategorized on August 11, 2017 by kls54. The research overviewed in this paper suggests that children will not develop an understanding of number as a representation of quantity through counting alone. This development is a complicated process that involves the interaction of a number of different quantitative aspects of a child’s daily life. From the research discussed above, a model (see Figure 1) is proposed of how these different components interact to contribute to a child’s developing understanding of numbers. The placement of the different components within the model indicates the interaction of the various components through time, not at particular times. Each is discussed briefly below. Protoquantitive comparison: Children, from about two years of age, become able to associate relational words with their innate ability to compare two amounts. They are able to say which is bigger or which amount has more or which has the most. Resnick calls this protoquantitive knowledge, though other researchers do not use this term, instead talking about relational knowledge. Children’s ability to subitize small amounts seems to develop out of their early ability to compare quantities. Children learn to associate a particular number word with a particular quantity. Starkey and Cooper (1995) found that by age two most children in their study could subitize one, two and three items, at three and a half years of age children subitize up to four items and by five they subitize up to five items. Sophian, Wood and Vong (1995), however, suggested that three and four year olds could subitize up to six items. At about two years of age, children begin to learn some of the principles of counting. They initially learn the first few words in the number sequence and to use one to one correspondence. Later they learn to give emphasis to the last word in the count. Children seem to initially learn these things as part of their socialization and may not link them with the idea of finding out how many. Even when children learn to repeat the last word of the number sequence in response to the how many question, they may not link this with the idea of quantity. Use counting to get. 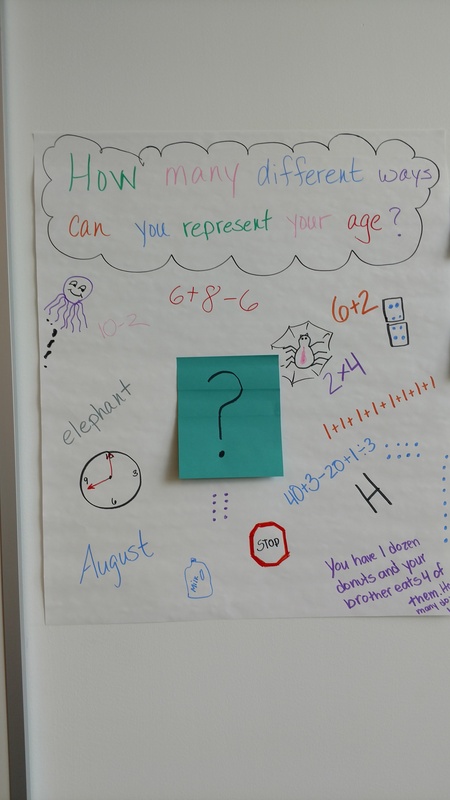 Counting and subitizing initially exist along side one another in a child’s mind as distinctly different processes. Children then begin to link the list of count words with the quantities that they know through subitizing and begin to understand that the last word said at the end of the count is telling them how many items in a collection. Children thus learn the quantitative significance of the number words in the counting process. 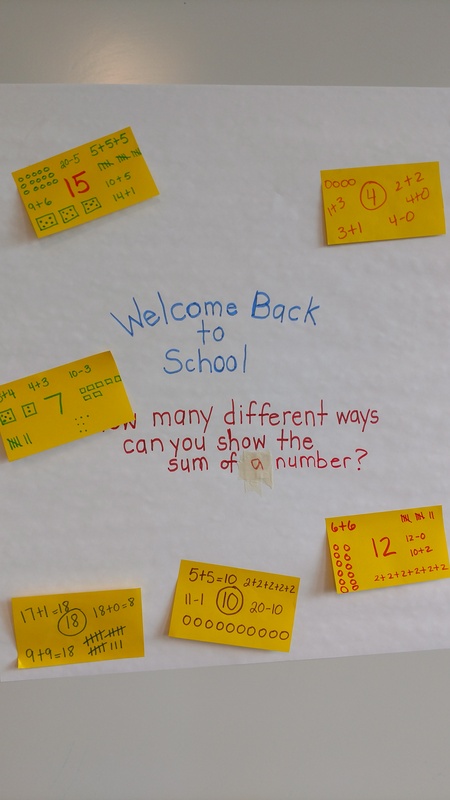 According to Fuson (1988) (cited by Nunes & Bryant, 1996) children, at about five years of age are able to use counting to quantify single sets and to get an amount of items when asked. After children understand numbers words and counting as a means of quantifying a single set, they develop a trust in their counting processes and learn that no matter which way they count a collection they must always get the same result. As a consequence they “trust the count” and choose to use it to solve relational problems such as to make equivalent sets. Children’s understanding of number from counting, subitizing, and part whole situations comes together so that they becom able to think about numbers as representations of quantity. They are able to disembed the number from the situation and so become able to think of any five items as “five”. The number becomes a conceptual entity in it’s own right. They understand the additive composition of number and so can think of numbers as compositions of other numbers, the number five, for example, can be thought of as three and two. 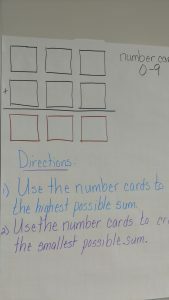 They can work with numbers alone without having to refer to a quantity of materials. Caveat: This model has been used as the basis for an investigation involving 25 children with learning disabilities in a Western Australian school (Treacy, 2001). 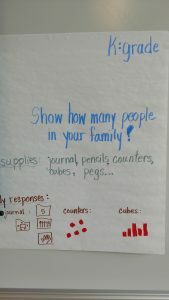 Tasks were developed for each of the components listed above and these were used to individually interview the children. It was found that the children showed understandings similar to those suggested by the model above. For example, there were some children who showed no evidence of understanding the quantity aspect of counting and yet could subitize to three or more. 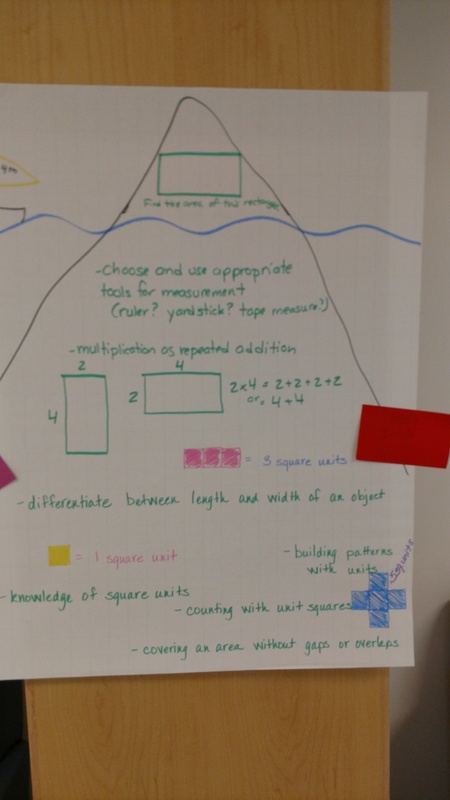 The teachers in this school found the model and the associated tasks particularly helpful in working out what their students knew and what they needed to know in order to develop a deeper understanding of number. Further research is needed however, to establish whether this model would be helpful for teachers working with children within the ‘normal’ range of intellectual ability. We began today with a good discussion about the place for calculators in the classroom. This is a very complex issue and relates to all sorts of other issues of “short cuts” versus “true understanding.” The general consensus seemed to be whether the tool is used as a crutch or for expediency once the process is fully understood. I offered to continue our conversation so please feel free to email me at kls54@psu.edu. I’d be happy to help with lesson ideas and even implementation if it is on a Thursday! 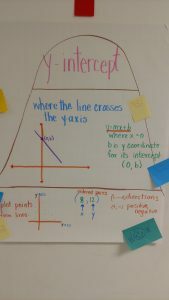 We moved into some more investigation of the percentage problem by looking at the work of several students. And ended with our Bungie Barbie activity. It was great working with all of you! Have a great summer. I will include another blog with some information from Chase and more on the research on mathematical developmental stages. We had some great discussion about linear relationships that were both proportional and not proportional and non-linear relationships. We followed up with some challenging questions from Block 4. 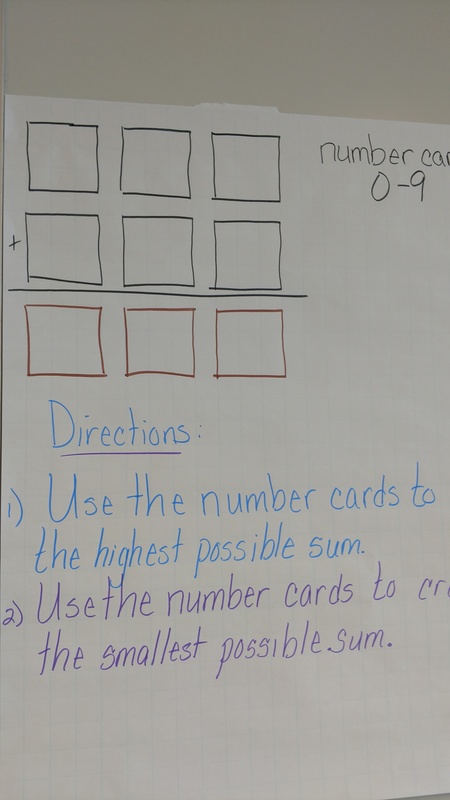 The end of our day consisted of a discussion about “Smarter than We Think” and a video about Cena whose understanding of place value might be a bit more fragile than her teacher thought. Here are the ideas I shared about inverse and number sense that you could use in a few extra minutes of class. I ask for two number whose product is 40 (or whose sum is 8). Then ask to find two other ones. After listing several look for a pattern. This can even lead in to negative numbers or fractions. 6→∎→10 what could have happened in the box? 6→∎→10→∎→6 what could have happened in the boxes? □→black box that multiplies by 2 and adds 4→ △ fill in the square and triangle with values. I put 2 and 3 in the black box and get out 5, what’s the black box doing? You can build on that with all sorts of processes. You can then have another box and have it undo the process of the first. I am starting with the number 7. I add 3 and then divide by 2 to get ______. How do I get back to the number 7 using the same number of steps I used? I am starting with the number 100, subtract 50, divide by 2, take square root. I end up with ______. How do I get back to 100 using the same number of steps I used? This entry was posted in Uncategorized on August 10, 2017 by kls54. Might be better for English Language learners and L.S. It takes more planning and foresight on the teachers part who must have thought about what might happen. Charles began our math discussion by looking at the work of a student on the hourglass problem. 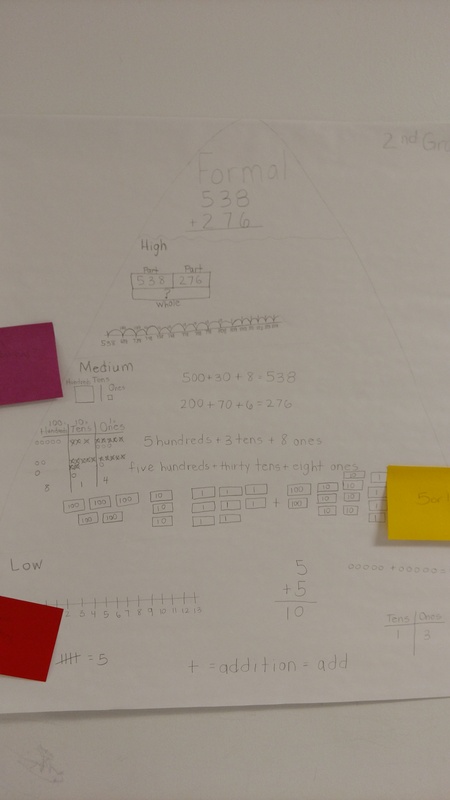 There was some good discussion about the work and the process and the accuracy of the mathematical representation. We ended the day with a pedagogy lesson involving making posters to define proportion, y intercept, x intercept, linear relationship and slope and we did a gallery walk for these posters. Homework: Read “Never Say Anything a Kid Can Say.” Record any question, “yea, buts” or comments in your journal. This entry was posted in Uncategorized on August 9, 2017 by kls54. “Most of the things that parents and kids believe about math learning are wrong,” said Dr. Boaler, who is the co-founder of Youcubed, a website that argues for a revolution in math teaching for all children, and offers resources to teachers, students and parents. 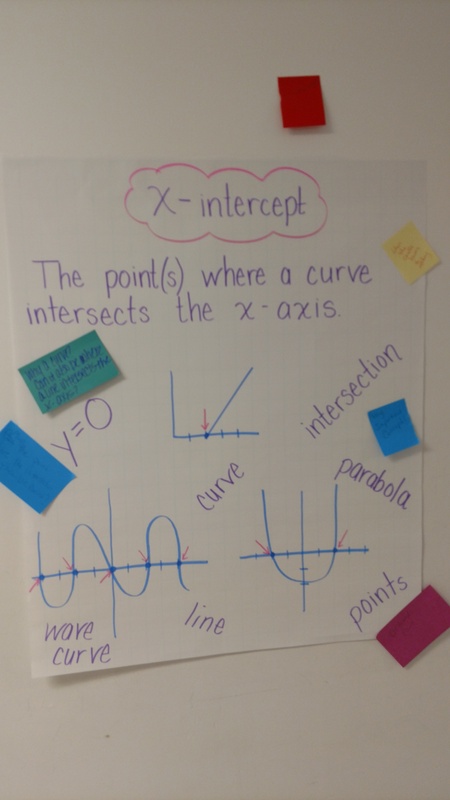 In fact, maybe what everyone needs — girls and boys both — is a different kind of math teaching, with much less emphasis on timed tests, and more attention to teaching math as a visual subject, and as a place for creativity. 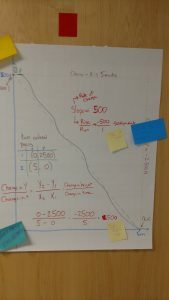 Another burning question was to think more about problem 3c on page 7 and I suggested using Excel to create the arrays for the division and the remainder. Charles began with the mathematical content on page 10 of block 1. There was good discussion about the inverse and how a function can be its own inverse. 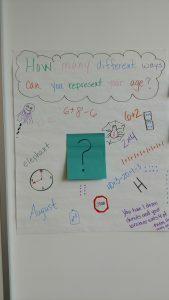 We spent some time practicing our questioning techniques and trying to use focusing questions to dig into the thinking processes of our students instated of funneling questions that lead to a certain type of thought process. 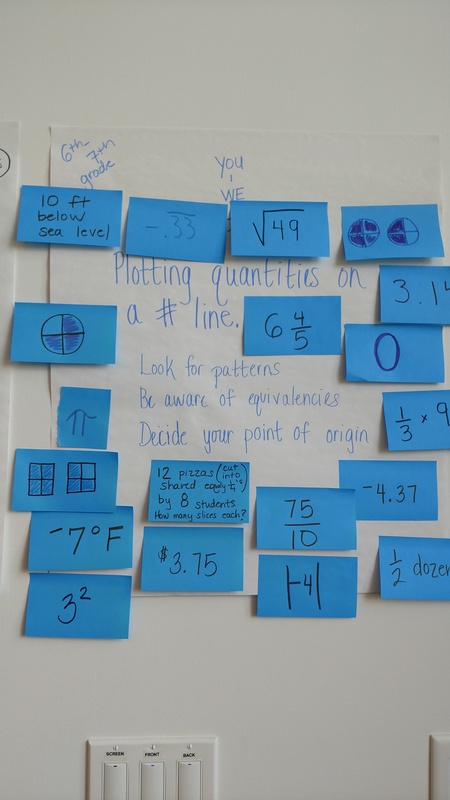 Read the article “Questioning our Pattern of Questioning” and think about the types of questions we asked in our pairings. Also percolate on the question – is it ever ok to use funneling questions? Tomorrow we will talk more about it. This entry was posted in Uncategorized on August 8, 2017 by kls54. We had four new participant join us this morning! 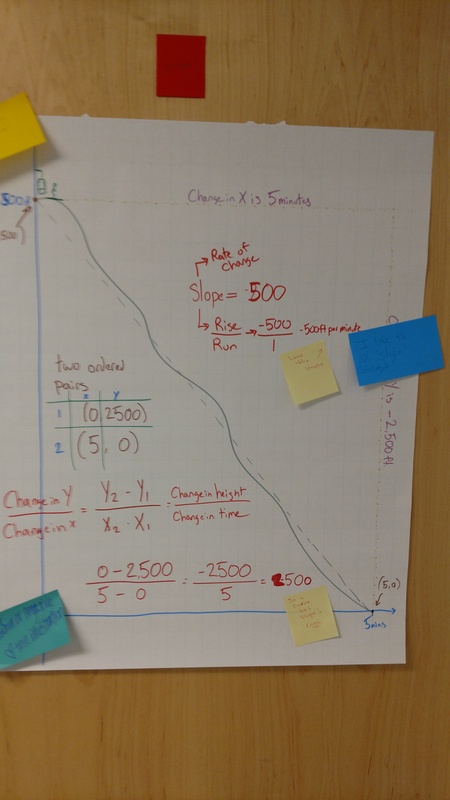 We began with a burning question from last week connecting scale factor and unit rate in solving proportions. We also discussed the norms we are trying to establish in the workshop which included – everyone being heard, no fear of making errors, and respect for each others’ ideas. Charles then led us into Block 1 with the sliding snail question. We realized we could use a piece-wise function to express the height at any integer time value. There was discussion about the value of generic rules for expressing even and odd numbers. We expressed an even number as 2n and an odd number as either 2n + 1 or 2n – 1. We had some good discussion about whether a remainder is negative or positive when dividing a negative number by a positive. We found that thinking of it as positive made the problem of comparing 3/4 and (-24/4) and (27/4). We talked about graphing the walk to the bus stop and showed that the steepness of the line can show the speed of my travel. Charles recommended the going further problems on page 9. In questioning in small groups of students working on a problem, a teacher noticed that when she asked a “focusing” question, the students continued to look at their work and continued to engage in their own dialogue. When she asked a “funneling” question, the students looked up at the teacher. Comment on these observations. Look at Maddie’s work and Gabe’s work, shown in figure 22 on page 55. 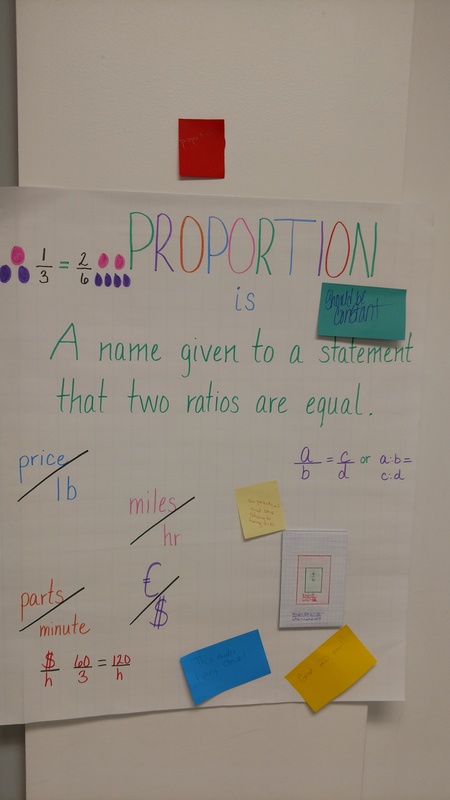 How could Ms. Lewis leverage the student’s representations to develop Maddie’s understanding of the problem? This entry was posted in Uncategorized on August 7, 2017 by kls54. Kim addressed the burning questions. We discussed how important it is to be constantly learning and it is good to realize the proof of some of these properties is very complex and require the use of variables and logic. Luckily we don’t have to prove the properties an theorems over and over – someone did that for us but if we are going to use them it is good to have an idea of how it was proven. We also reviewed that dividing by zero never gives a numerical answer. 6/0 is undefined. 0/0 is indeterminate. Charles answered some multiplication questions and then headed into the division. There was some good discussion about the difference between partitive and quotative division. There was great discussion about how difficult it can be to take this time for ourselves and our own growth without constantly trying to figure how it can help our students. Teachers don’t always have this opportunity – even during in-service. 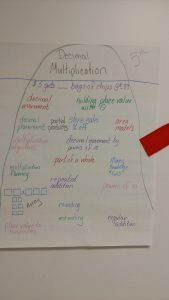 We talked a lot about positive and negative numbers and using the area model for multiplying fractions – we agreed that the model has its limitations for multiplying mixed numbers. 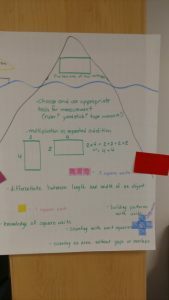 We thought using the distributive property helped with that – for example – 4 1/2 x 2 1/3 – you could do 4 x 2 + 4 x 1/3 + 2 x 1/2 + 1/3 x 1/2 and use the area model for 1/2 times 1/3. We also discussed the ideas that were evident in Ms. Flahive’s and Ms. Ramirez’s classrooms from Principles to Action. 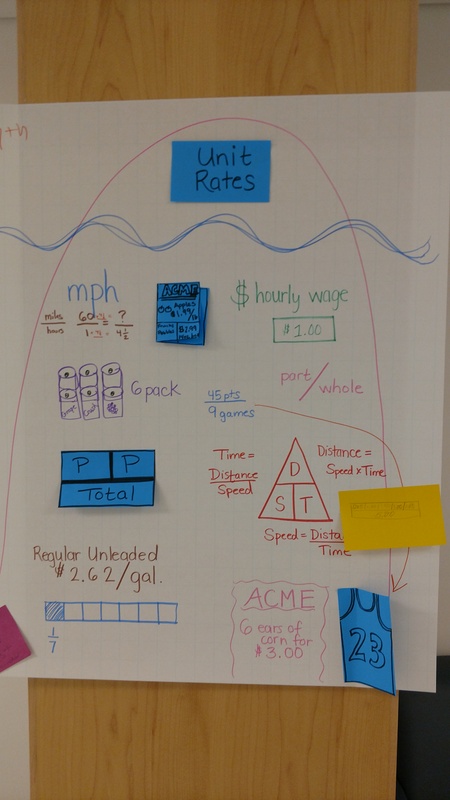 And then worked on coming up with rich problems for use in our classroom to set the tone for the new year. We will continue this idea tomorrow as some of us are ending the workshop then. Read the reference material on pages 11 and 13 of Block 3. Read the message entitled “Upside Down Teaching” and in your notebook, complete respond to the discussion prompts for teachers at the end of the message (on p. 94). 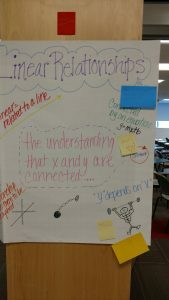 Try to make connections about what we’ve read about and discussed so far in PMI. This entry was posted in Uncategorized on August 3, 2017 by kls54.